When you rig up your Slingshot Kite (rigging your bar from behind the kite), make sure that your bridles to which the front lines are attached, look the same as the picture above. The bridles of the kite must not be tangled or twisted and the small red line must be on top (unless you fly a Slingshot Rally or Fuel). 2. How to trim your Slingshot Fuel? Our favourite setting is the one you can see on the picture above. We use on the back lines (left) the first knot (the knot furthes away from your Fuel kite), and on the center lines (right) the second knot. This is our standard setting and we think the Fuel kite flies best this way. Only in very light wind we recommend to use the first knot on the center line, and in very strong, overpowered conditions, when you dont have a smaller kite available, the third knot of the center lines to trim your Fuel kite. There are four attachment points for bar pressure. On the picture above you can see how the kite comes out of the box. The bar pressure ist mostly personal preference, you can try out all settings and decide for yourself what fits you and your style of riding best. 3. 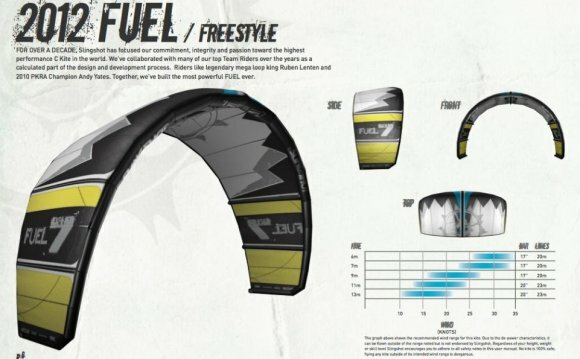 Wakestyle or Freestlye Slingshot Fuel? Freestyle is the standard setting when you buy a new Slingshot Fuel. If you do unhooked tricks and are into wakestyle, use the wakestyle setting. If you don't, use the freestyle setting. The kite responds a little bit better and has a bit more depower. Also use the freestyle setting for wave riding.